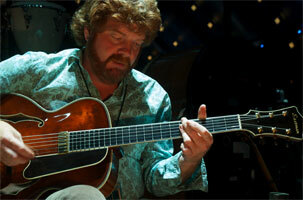 Chanteur Country US né Lyman Corbitt McAnally Jr. le 15 Juillet 1957 à Red Bay (Alabama). A prolific Nashville singer/songwriter who authored hits for Jimmy Buffett, Alabama, and Steve Wariner, Mac McAnally was born July 15, 1957, in Red Bay, AL. Singing in church throughout childhood, at age eight he began taking piano lessons and within five years was performing professionally; McAnally later took up guitar and at 15 composed his first song, "People Call Me Jesus." After quitting high school he went to work as a session player at Muscle Shoals' Wishbone Studios; one night, during a break in a Hank Williams Jr. date, McAnally began playing some of his own original material, so impressing producers Terry Woodford and Clayton Ivey that they convinced Williams to record the tune "I Need You Tonight." 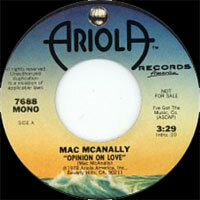 Signing to Ariola, in 1977 McAnally issued his self-titled debut album, scoring a crossover hit with the single "It's a Crazy World" and touring in support of Randy Newman. 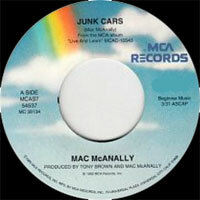 Acclaimed for the richly literary appeal of his songcraft, McAnally returned in 1978 with No Problem Here, followed two years later by Cuttin' Corners; neither sold as well as his debut, but he remained one of Nashville's most sought-after writers, penning material for Buffett ("It's My Job") and Alabama (the chart-topping "Old Flame"). 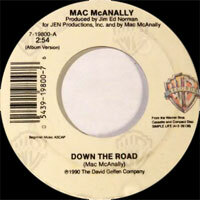 In the wake of 1983's Nothin' but the Truth, McAnally did not release another new LP until Finish Lines five years later, in the interim penning hits for Buffett ("When the Coast Is Clear") and Ricky Van Shelton ("Crime of Passion"); with 1990's Simple Life, he returned to the charts with "Back Where I Come From," and a year later authored the Wariner smash "It's a Precious Thing." 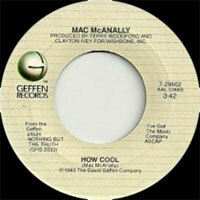 After 1992's Live and Learn (which generated the minor hits "The Trouble With Diamonds" and "Junk Cars"), McAnally resurfaced two years later with Knots, remaining silent until releasing Word of Mouth in mid-1999. It was a long wait again before Down by the River appeared in 2009 from Showdog Nashville. 1977 SP ARIOLA 7665 (US) . 1977 SP ARIOLA 7671 (US) . 1978 SP ARIOLA 7688 (US) . 05/1980 SP RCA VICTOR PB-12026 (US) . 01/1983 SP GEFFEN 7-29736 (US) . 06/1983 SP GEFFEN 7-29602 (US) . 08/1983 SP GEFFEN 7-29515 (US) . 10/1988 SP GEFFEN 7-27675 (US) . 01/1990 SP WARNER BROS. 7-22662 (US) . 05/1990 SP WARNER BROS. 7-19800 (US) . 03/1992 SP MCA MCAS7-54372 (US) . 07/1992 SP MCA MCAS7-54450 (US) . 11/1992 SP MCA MCAS7-54537 (US) . 03/1993 SP MCA MCAS7-54629 (US) . 02/1994 SP MCA MCAS7-54818 (US) .